The Fisher Cats had a deep starting rotation this season that was bolstered after the return of Sean Nolin and Marcus Stroman. Despite the two young stars, there were other, very solid pitchers for this team. Marcus Walden, 25, had quite a good season for the Fisher Cats in his first year at the Double-A level. After a strong 2012 split between Lansing and Dunedin, Walden registered a 3.71 ERA, 1.44 WHIP, 88 strikeouts and 50 walks in a team-leading 162 1/3 innings. A ninth-round pick of the Blue Jays from the 2007 draft, Walden has worked his way up through the organization. Pitching coach Tom Signore spoke very highly of Walden who is an efficient, ground-ball focused pitcher. While his stuff isn’t dazzling and he doesn’t get a lot of strikeouts (only a 12.5% K rate), Walden is a workhorse who can work deep into games because of his “pitch-to-contact” mentality. Walden could wind up in Buffalo next year, especially since there has been the suggestion that the Triple-A rotation could be filled with home-grown players. Much has been written about the enigmatic Deck McGuire. The 24 year old was the 11th overall pick for the Blue Jays in the 2010 draft out of the Georgia Institute of Technology. I’ve already written an extensive scouting report after seeing him in late June and I’ve spoken to pitching coach Tom Signore about him. He had a much better year in 2013 than he did in 2012 and could be turning the corner. Throwing 157 1/3 innings for the Fisher Cats, Deck had a 4.81 ERA (with a 3.58 FIP), a 1.32 WHIP with a team-leading 143 strikeouts and a very respectable 59 walks. All this put together shows that McGuire’s stuff has developed as hoped and that, if he can pick up the mental part of his game, could be a solid number-five starter for a major league team in the near future. I can see him in Buffalo next year to start the season. Ryan Tepera, 25, is a name that many Blue Jays fans won’t know but he’s been an essential part of the Blue Jays system since being selected in the 19th round of the 2009 draft. The 6’1″ Texan showed some tangible improvement over his 2012 season (mostly in New Hampshire), making 20 starts in 2013 (out of 33 appearances) and having a 4.50 ERA, 1.42 WHIP, 105 strikeouts and 56 walks in 116 innings pitched. Tepera improved in every category over last year and had a very solid year. He should be returning to New Hampshire next year with the Buffalo rotation and bullpen potentially very crowded. If you haven’t heard of Marcus Stroman by now, then you just haven’t been paying attention to the Blue Jays. Stroman, 22, made headlines first by being the Blue Jays second first-round draft pick in 2012 (22nd overall) out of Duke with prospect prognosticators saying that he had the most major-league-ready stuff of anyone in the draft. He then earned even more ink by getting suspended towards the end of last season for testing positive for Methylhexaneamine. With the 50-game suspension settled (and everyone ascribing that to an honest mistake with over-the-counter, post-workout supplements) Stroman went out to show that he had major league stuff, first landing on the radar by pitching four scoreless, hitless innings at the end of Spring Training (including two innings against the Phillies in Philadelphia). Stroman’s season, by any accounting, was exceptional. While many writers think that he’s too small to be able to hold up to the rigours of starting, the Blue Jays (and Stroman) want to prove them wrong and the Medford, NY native certainly went about doing that. Throwing 111 2/3 innings this season, Stroman had a 3.30 ERA, a 1.13 WHIP, with an outstanding 129 strikeouts and only 27 walks. If there’s a fly in the ointment, it’s only that Stroman showed a tendency to give up home runs (13 this season) but otherwise, he’s looking ready to compete for a job in the Blue Jays rotation next year. To be perfectly honest, because he’s not already on the 40-man roster (and doesn’t need to be for at least two more years), I can see Stroman going to Buffalo next year to start the season and be ready to come up to the big leagues when needed. For our own interview with Stroman, check out the Blue Jays from Away Podcast Episode 10. 6’5″ lefty Sean Nolin is another name that will likely be familiar to Blue Jays fans. After coming up to the majors for one start, Nolin gained a lot more notoriety on the Jays scene. The 23 year old was drafted in the 6th round in 2010 and has found himself in the upper echelons of prospects lists (partially due to so many higher ranked prospects getting traded away) after an outstanding 2012 split between Dunedin and New Hampshire. 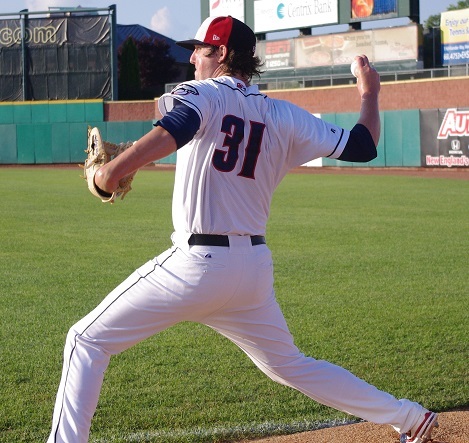 In 2013, despite starting late because of an injury (that wasn’t to his arm), Nolin put up a 3.01 ERA, a 1.23 WHIP, 103 strikeouts and 23 walks in 92 2/3 innings with the Fisher Cats. In addition to his major league cup of coffee, he also earned a promotion to Buffalo where he made three very strong starts, with a 1.73 ERA and 13 strikeouts in 17 2/3 innings. He did struggle with his control in Buffalo, walking 10 batters. Nolin, now on the 40-man roster, is firmly in the hunt for a starting spot in 2014 although he has a lot of competition. After a stint in winter ball this offseason, expect to see Nolin pick up where he left off in Buffalo. For our own interview with Nolin, check out the Blue Jays from Away Podcast Episode 10.